Western Americana persists and thrives on the northern Great Plains. 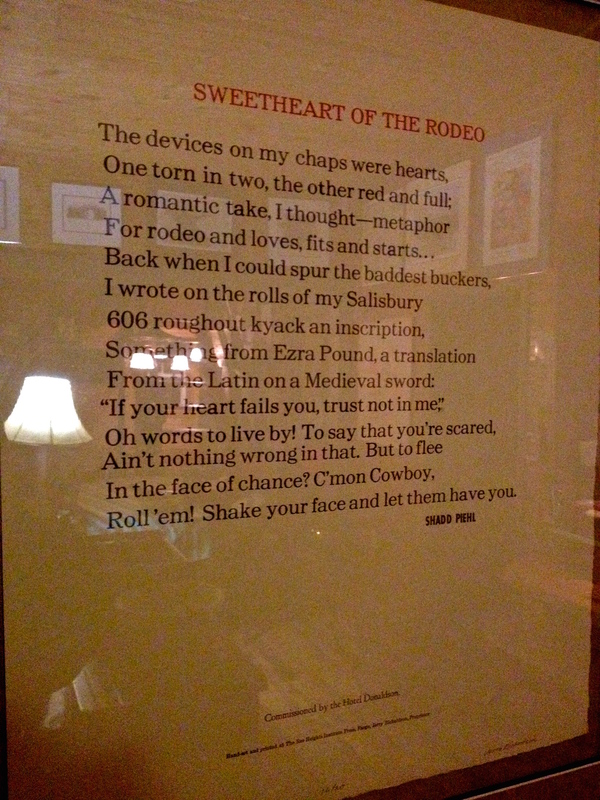 A photo of a poem from cowboy poet Shadd Piehl, this commissioned by the Hotel Donaldson, Fargo. Shadd is a good friend. The Bohemian pulse runs thick in the Piehl DNA (see here for detail). Some days I know we’re living out a long extension of a Willa Cather My Ántonia novel here in the 21st century. We’re sitting in the saddle of the 49th parallel on the northern Great Plains, North America. Molly and I have been straightening up the flat this weekend, taking short breaks here and there as well. It is really fantastic to be engaged to a professional artist and art teacher for numerous reasons. Molly has a range of medium she works in, including custom mosaics, piano playing and teaching piano, guitar and ukulele playing, mastering the Swedish folk art of Dalmål, and on and on. Of all these mediums, included in a short YouTube video below is Molly’s rendition of Feist’s 1-2-3-4 (the Sesame Street version is linked to here as well). One of the many spectacular reasons that live performance is, well, spectacular has to do with the direct interaction that stage performers have with their environment and the audience. It’s an exchange. Of course, I have recorded and uploaded Molly’s impromptu performance on the YouTubes (thereby digitizing and preserving it in some kind of digital cloud space and time). But it is a slice of the reality that took place. Part of this reality is the unforeseen, as when a BNSF train horn rolling through downtown Fargo let loose about 0:43 and 0:57 in the video. Then a breeze decided to shut the door at about 1:01 in the video. But again, this is live, DIY, living room flat performance. And the band, and life, plays on. One of the only known Pizza Hut ET commemorative glasses in North Dakota’s Sheyenne River Valley. Throughout last week I’ve been following the media trail of four friends — Andrew Reinhard, Richard Rothaus, Bill Caraher, and Bret Weber — who were mustered into a modern archaeological dig in New Mexico. The goal was to dig up a pile of ET Atari games that were buried after the craptacular game hit the shelves in 1983. When this game hit the shelves, it signaled the beginning of the end for Atari, as Atari lost (according to the Wikipedia page) over a half-billion dollars after buying the rights from Spielberg; over-producing a terrible game; and banking on the idea that customers would rip them from the shelves. They did, to a degree. But the video gamers returned them for a refund as well. So I kept up with the social media and stories, noting to myself that the archaeology of ET Atari games was more popular than the actual 1983 game. I was also happy to read that Caraher made Rolling Stone. Check it out in the link here. CNN covered the story too. Daniel Politi of Slate.com also covered the story, as did Dominic Rushe of The Guardian, and NPR’s Morning Edition ran a story here. Eric Mack of Forbes covered Andrew Reinhard here (well, the picture is of Andrew). And The Onion covered it here. The more local Fargo Forum ran a story on it here, too. And you can get direct, unadulterated coverage of the ET dig from Bill Caraher’s blog here. 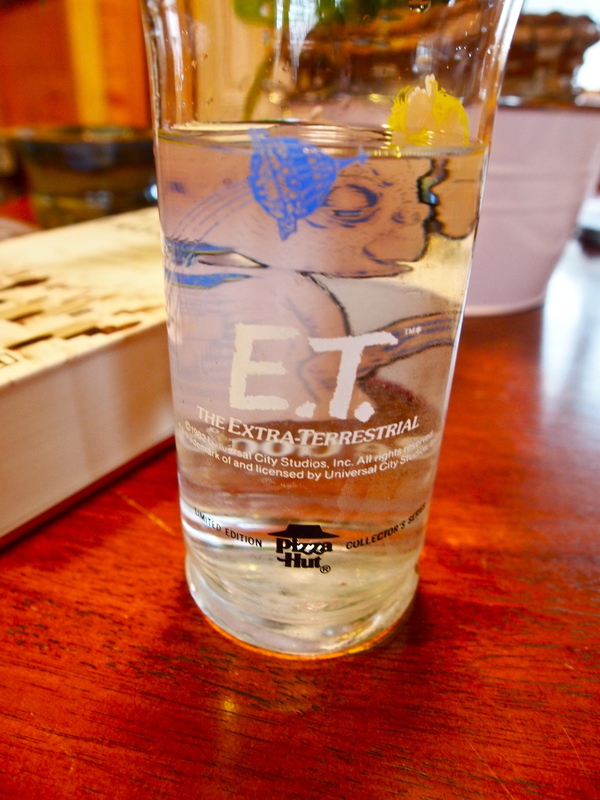 So while holding down the bunker in North Dakota, and while reading these stories, I would often take sips from the ET glass pictured here. The glass comes from my fiancée’s sister’s Valley City home. I think it was a thrift store find some time ago. I still have to set down and get an official oral history. Photo by Holly Anderson Battocchi by Tricia Fossum. 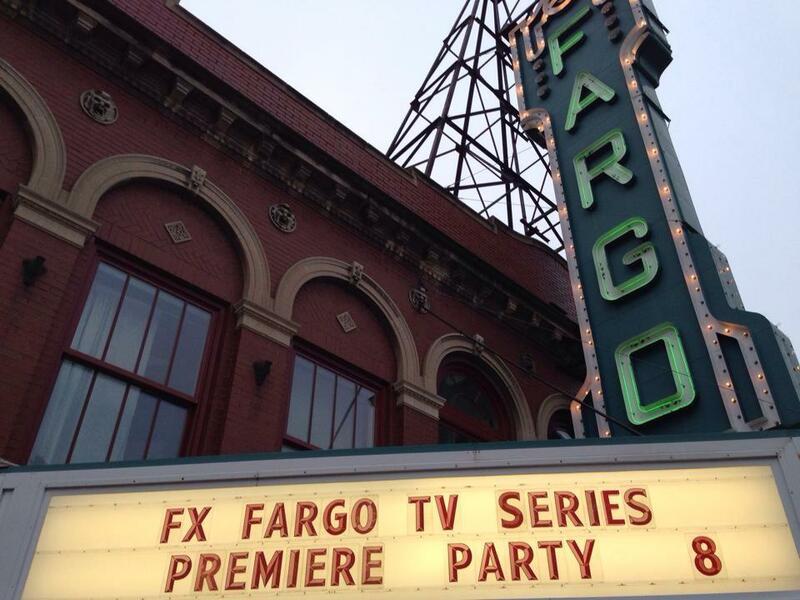 As the title of this blog entry suggests, since Molly and I live in historic downtown Fargo, we (like many Fargoans) decided to host a pre-game get-together before the 9:00PM (CST) sharp showing of FX’s “Fargo” television series at The Fargo Theater in downtown Fargo, North Dakota. Yes, a kind of Fargo-Fargo-Fargo post-modernity, or something along those lines. My mind is still reeling about the implications, since every North Dakotan knows that the glorious Coen brothers film Fargo was almost entirely filmed in Minnesota. You betcha. But that is less and less transparent the further one is from Fargo. So I am convinced and know that some kind of global Fargo diaspora has developed, and is only reshaped and pushed in different directions with this television series. It’s kind of like when someone who is born in Chicago with Irish genealogy listens to modern Irish music and says, “I’m Irish.” Actually, it’s not anything like that. Nevermind. On to the Fargo evening, though. Hot dish and jello salad photo by Molly McLain. 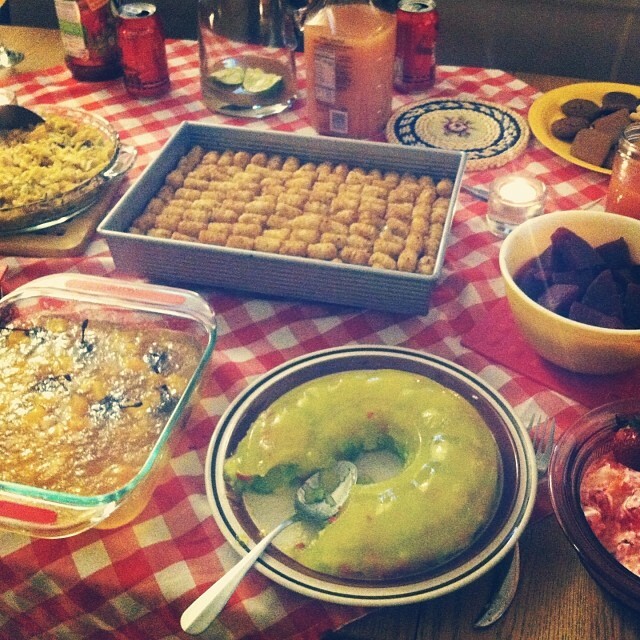 Hot dish and jello salads provided by Fargoans. The conversation flowed, as did the hot dish and jello salads last night. So much that I didn’t get a chance to snap any photos of the event. But several friends did. I pulled a few of the photos from the social media this evening. That is why you get a picture of the hot-dish spread, taken by Molly. The other photos are from our highly trained professional photographer friend, Holly Anderson Battocchi (yes, her Italian-American husband Dante lives in Fargo too). At the end of our get-together, one large group left the pre game Fargo-Fargo-Fargo get-together to take in the FX “Fargo” premiere. A smaller group (that’s us) decided to stay behind at our apartment. We rationalized us not attending “Fargo” by saying we don’t need to see “Fargo” because we are and live and create Fargo, everyday. Aw, geez. 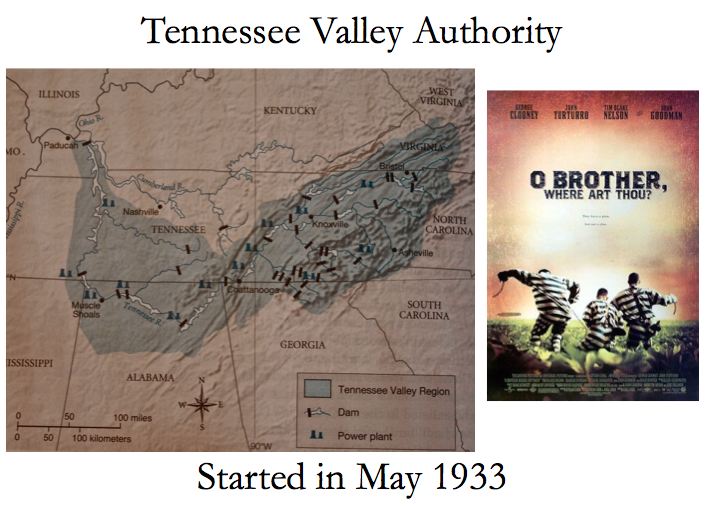 For the second lecture on the Great Depression tomorrow at North Dakota State University in Fargo, I’m showing a map of the Tennessee Valley Authority with the handbill for “O’ Brother Where Art Thou,” (2000) the backdrop of the movie set in the TVA of the 30s. My reasoning is that 1) this is a fun visual; 2) the Coen Brothers are great; and 3) students in the future are much more likely to see “O’ Brother” than a TVA map. The idea is that both of these visuals will leave a singular imprint, and from here on out when they hear George Clooney lip sync, there’s a greater possibility that they’ll think about the history of the TVA, the Great Depression, FDR’s responses, hydroelectric power dams, etc. It’s about 3:23PM, so I thought I’d break just a moment for tea and a blog entry to throw out a little PR for some colleagues and friends. Two events are going down in Fargo this Saturday, March 15. Well, wait a minute: certainly there are more than two events going down in Fargo this Saturday. But here are the two events that I know of right now, this Monday afternoon. The two that I’m going to talk about. You should definitely go see other events, too, above and beyond this. The first event is a benefit for a friend and scholar, Mike Casler. Mike was diagnosed with thyroid cancer in 2011, and he’s been through a battery of surgeries and radiation treatment. Mike, along with a bunch of us, are gathering at The Bowler in Fargo (2630 South University Dr.) anywhere from 4:00-11:55PM for the official Mike Casler Benefit Fund — again this Saturday, March 15. Also, Mike is the author and historian of several upper Missouri River scholarly works, including Steamboats of the Fort Union Fur Trade: An Illustrated Listing of Steamboats on the Upper Missouri River, 1831-1867 (Ft. Union Association, 1999); and he regularly collaborates and conspires (in a good way) with the Great Plains titan of anthro, archaeology and history, W. Raymond Wood (some of Ray’s works here, here, and here, and his memoirs here). And also on Saturday, March 15, Keith Bear will be playing Mandan-Hidatsa flute at 8:15PM in The Avalon. This is a part of the larger Great Winter Crow Show organized by Dawn and the Spirit Room Galleries. Also check that out from 5:00-10:00PM. You can read more about Keith at this link here. The event is sponsored by the Avalon Event Center, the Lake Region Art Council, and the North Dakota Humanities Council. Okay, that was a 5-minute blog post update. Back to it. There’s something like a 3rd or 7th polar vortex bearing down on the northern Great Plains and Great Lakes region on this sunny, cold Saturday lunch hour. 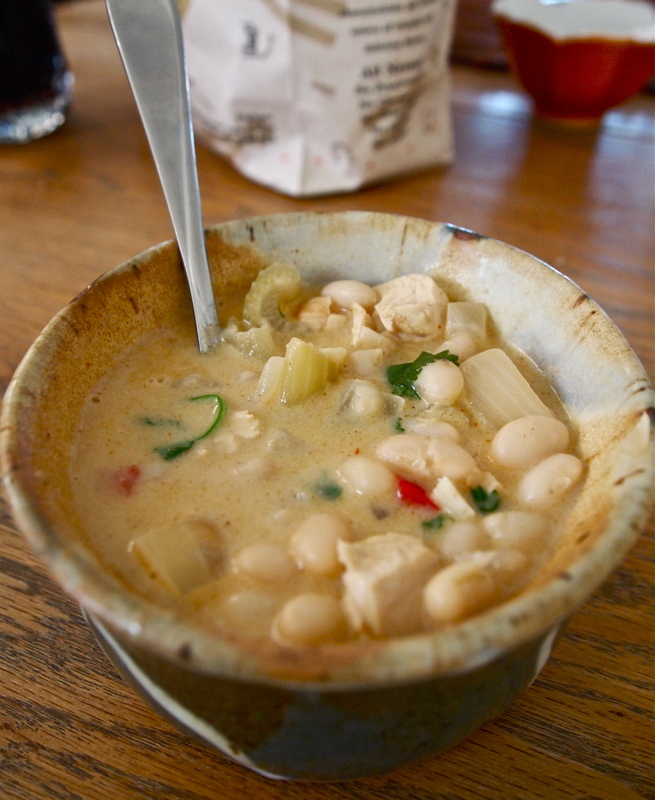 Yesterday Molly suggested that we make white chicken chili. I set the navy beans to soaking yesterday afternoon, and she put soup together just before lunch today. Lots of coriander, cumin, Tochi’s taco seasoning, green and red chilies, etc. This is what she was telling me after I asked, “Why is this so delicious?” We also added cilantro just before serving. Note: what you can’t see in this photo are the two chihuahuas at my feet. Seriously. They are named Willow and Honey. This soup is heating us up for sure. Polar vortex, your serve.